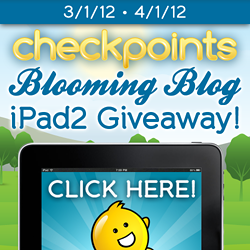 CheckPoints provides you an App that pays you back! Here's a special promo for my readers - when you register for an account with CheckPoints use the bonus code: booksrus and you will automatically get enough CheckPoints for a free and instant $1 gift card or charitable donation. What a great way to be rewarded for doing what we love - SHOPPING so sign up (iPhone) (Android) and don't forget to use the booksrus code to grab your free CheckPoints! 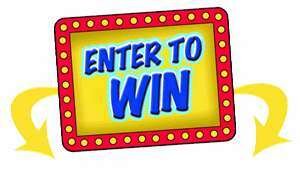 There are 50 participating blogs, but you only need to enter the giveaway on one of our blogs. Good luck! I would use my iPad a little bit for work, but A LOT for playing! I love shopping, surfing & Pinterest-ing online! I would use it for all my deal finding! I would use it whenever I leave my house, especially those times when I have to sit and wait for one of my three kids. I would use it to keep in touch with the news. I can do so from anywhere. I'd use it some for my job, but mostly it would be for fun. Reading eBooks, checking email, watching videos, etc. I'd use it mostly for school. Also to read ebooks!! Thanks for the giveaway! I would use an iPad for plain fun, keeping kids entertained during long doctor waits etc, and reading eBooks. I would redeem my points for an Amazon.com GC so I can buy my dog's refractometer.